Prope is bringing out Let’s Tap, an extremely unique game for the Wii. As if the Wiimote didn’t provide enough interesting control methods, Let’s Tap has you placing the Wiimote button-side down…and tapping your hands to the carpet/table/ect. that the Wiimote is sitting on. In the trailer, we see a woman playing the game by placing a Wiimote on the Wii hardware box. 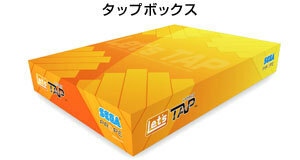 While this tapping method will work with millions of materials, Sega is giving the game box double-duty. As you can see, the case for the box makes for a perfect tapping platform.